I have previously written why we should not support a Balanced Budget Amendment. A BBA would lead to a loss of separation of powers with the Supreme Court making budget decisions when Congress could not come to agreement on a balanced budget. Balancing the budget would be too painful and cause deep political unrest with the deep cuts in spending to entitlements that would be absolutely necessary. With or without a balanced budget amendment, sadly, America is headed down the same path of insolvency like Greece and other European nations. 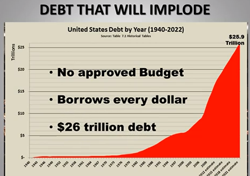 The video below, by a long-time Accountant, explains why Congress cannot balance the budget however important balanced budgets are to our economic security. Our national debt has grown too large. This video should be watched by every American—especially all the Washington, DC politicians and bureaucrats.